Red Sox closer Koji Uehara has playoff experience and a reasonable contract. 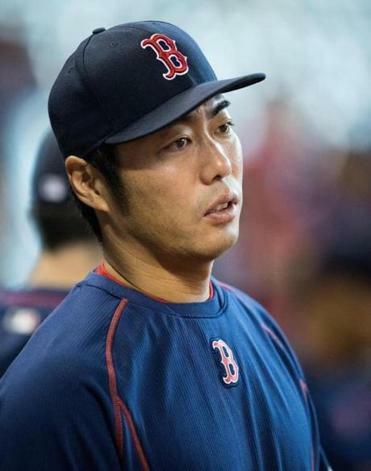 HOUSTON — Koji Uehara was a trading deadline survivor last season, staying with the Red Sox after teammates John Lackey, Jon Lester, Andrew Miller, and Jake Peavy were dealt. The Sox then signed their closer to a two-year, $18 million extension in October. Now, a year later, the Red Sox are again in last place and Uehara wonders what will happen this time. On the surface, the Red Sox lack attractive trade candidates. They have a group of underachieving veterans signed to long-term contracts and another group of spare-part types. Young cornerstones such as Xander Bogaerts and Mookie Betts would appear to be keepers. But Uehara is a high-level player with playoff experience signed to a reasonable contract. If the Red Sox make him available — and teams have inquired, according to major league sources — the return could be significant. At 40, Uehara is still pitching well. He has a 2.67 ERA and 0.89 WHIP over 37 appearances this season and had converted 22 of 24 save chances. In 2013, Uehara allowed one run in 13⅔ postseason innings. A day after Dr. James Andrews checked out his right elbow, Clay Buchholz said he was optimistic about pitching again this season. Buchholz has been on the disabled list since July 11 with a strained flexor muscle. Based on the program Andrews laid out, Buchholz expects it will take another 5-6 weeks before he returns to the mound. Andrews administered an injection of platelet-rich plasma into the injured area. That should speed healing and strengthen the muscle. Jason Vargas of the Royals had a similar injury, going on the DL in May with a flexor muscle strain. The injury did not heal properly, and on Tuesday Vargas suffered a ligament tear that will require Tommy John surgery. Buchholz is signed through the end of this season, with the Red Sox holding a $13 million option for 2016. Obviously, it would benefit Buchholz to return this season and demonstrate his ability to pitch. Since the start of the 2010 season, Buchholz has missed approximately 50 starts because of injuries, a number that will increase until he returns. He offers no excuses. Some good news for a change with the Red Sox: Christian Vazquez played catch for the first time since his Tommy John surgery in April and felt fine. Vazquez made 20 easy throws from 30 feet and 20 more from 40. It’s a drill he will repeat every other day for now. The Sox plan to have Vazquez get some at-bats in Instructional League and winter ball. The hope is he would be ready to play early next season. To commemorate Pedro Martinez’s induction into the Hall of Fame on Sunday, the Red Sox will have several days of tributes at Fenway Park. Before Sunday’s 8 p.m. start against the Tigers, the Sox will show a video of Martinez’s acceptance speech in Cooperstown earlier that day on the scoreboard at 7 p.m.
On Monday, the team will give all fans a Martinez decal featuring his No. 45. On Tuesday, the Sox will retire Martinez’s number. Fans will receive a replica of his Hall of Fame plaque. On Wednesday, the Sox will repeat the number retirement ceremony in Spanish. Fans will receive Dominican flags and postcard replicas of the words on Martinez’s Hall of Fame plaque in Spanish. On both nights, Pedro’s actual Hall of Fame plaque will be on display at Fenway. Fans are invited to take pictures of it and with it. The plaque also will be accessible to all fans at the Red Sox Team Store on Yawkey Way from 10 a.m.-4 p.m. on Wednesday. Rick Porcello will face his old team, the Detroit Tigers, at Fenway Friday night. Steven Wright will be called up to start Saturday, with Eduardo Rodriguez going Sunday. Manager John Farrell said the Sox wanted to get the knuckleballer between the two conventional pitchers . . . Dustin Pedroia, who had played all but four innings since coming off the disabled list on Friday, was out of the lineup and Brock Holt started at second . . . The Red Sox announced that free WiFi would be available at Fenway starting Friday. The capacity within the park was tripled . . . Nomar Garciaparra turned 42 on Thursday. The former Sox shortstop is now a Dodgers broadcaster and raising three children with his wife, Mia Hamm.